The New Approach colt was a Group Three winner as a juvenile, having claimed the Solario Stakes at Sandown in September, and performed with credit at the highest level in both the Prix Jean-Luc Lagardere at Chantilly and at the Breeders' Cup. 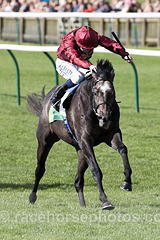 However, he returned to Britain with something to prove after disappointing on the dirt in Dubai last month and looked to have plenty on his plate in any case, with John Gosden's Royal Lodge winner and Racing Post Trophy runner-up Roaring Lion in opposition. Roaring Lion was the 8-13 favourite to cement his Classic claims on his seasonal reappearance, but was unable to lay a glove on 7-2 shot Masar, who went straight to the lead and eventually pulled nine lengths clear to seal a spectacular success under William Buick. 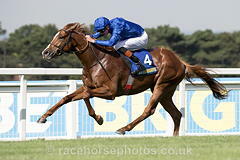 Trainer Charlie Appleby said: "On what we've seen out there he's going to be a big contender (for the Guineas). He's a live shot, no doubt about that. "We were confident we were either going to win or finish second to Roaring Lion." Appleby added: " In Meydan he was a bit gassy and wanted to get on with it. Today we've taken the hood off. "It was never the intention to run him there (Dubai), but he was getting a bit too well. I needed to get a run into him to put some manners on him and the intention was always to come to the Craven anyway. "Obviously the Guineas route is going to be foremost in our sights now." In the end, Roaring Lion was narrowly beaten to the runner-up spot by White Mocha, but Gosden was not ruling out a Guineas bid. He said: " You get a small field here. They go steady, steady, steady and then 'boom' from the bushes. "I'm perfectly happy. He was 80 per cent. He tired in the last furlong. "For me, he needs an end-to-end gallop. He does not want a steady one and a dash. I'm perfectly happy with the horse." He added: " He may well go for the Guineas. I'd hope there'd be proper pace all the way. There usually is. It's very different to the trial. "I think his strength in the end will be a mile and a quarter at least. He's beautifully bred to do that. "He's in the Prix du Jockey Club as well, but the Guineas is still very much an option." Hugo Palmer said of the runner-up White Mocha: "We'll probably skip the Guineas and go a mile and a quarter next time."